Quick sand formation/condition is not a soil type. 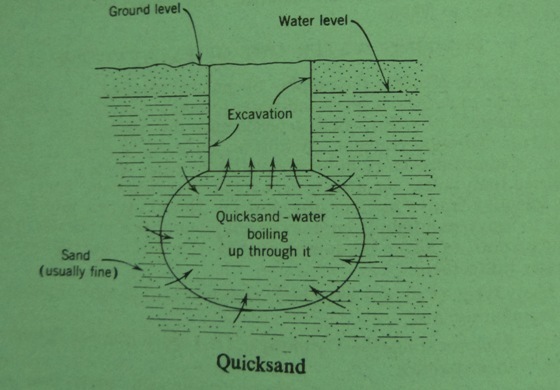 Quick sand formation/condition is created in saturated thick layers of loose fine sandy soils when disturbed either due to vibration such as from pile driving in the near by locality or due to the presence of flowing water. The particles in trying to achieve a closer packing will force the pore water upwards and out at the surface and if this has sufficient velocity to cause a flotation or boiling up of the particles, the sand particles begin to move horizontally and get lifted up, the bottom sand rising up and its space is occupied by the adjoining particles, thus making a regular movement. The ﬁner the sand the more readily it is affected by a current of water, especially if it contains a little clay. A particular form of this known as piping is met within coffer dam failures. Under such conditions the material may be carried off from under a structure, which can result in the settlement of buildings at a considerable distance. Even if a full ﬂow is not created, the stability of the soil is lessened due to the upward seepage pressure. The condition can be corrected by lowering head of water by underground drainage. lf there is any chance of excavation or pumping on adjoining sites causing a “loss of ground” beneath the structure by releasing a layer of running sand. this layer should be effectively conﬁned by sheet piling. Running sand: Sand below the natural ground water level. which is carried into the trenches, trial pits or boreholes by the ﬂow of ground water as excavation proceeds.